Stormy came to us as a three-month-old baby and she was blind. Her momma had a problem nursing and it wasn’t detected until after little Stormy went septic and the infection went to her eyes blinding her. She is lucky to be alive. Her momma, Big Momma was a pure bred Maine Anjou and the breed originates in France. (See below for the history of the breed and how it came to the United States.) 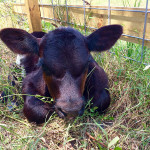 Stormy was a Maine Anjou/Brangus cross and is the most adorable baby ever. She loved her bottle and always wanted to cuddle, nuzzle and be close for an hour or so after feeding. Being her surrogate was such a joy—to get to know and feel the connection of a baby to her caregiver is truly a miracle. She came to us out of the desperate plea of a breeder that couldn’t bear seeing this baby grow up blind and confined—and the thought of slaughtering this innocent baby was out of the question for her so they reached out to Rowdy Girl and Stormy was growing up with confidence—she had her own manger and went on daily walks to hang with the big girls. 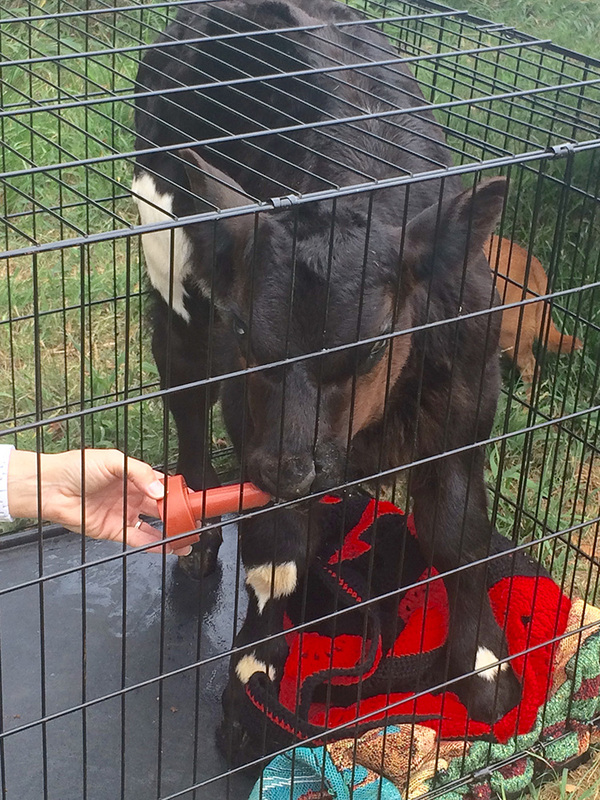 I just spoke with you on fb about our baby calf that is blind. She was born with her eye sight, however she wasn’t able to nurse from her mom and went septic very quickly. We got her to the vet, but the infection had damaged her vision. She is eating and is a healthy baby now, but blind. We have her pinned in a stall all day and we are bottle feeding her. We introduced her to feed, but she is still wanting the bottle. She is very cautious when walking and moves very slow. It’s very hard to watch her and not know what to do. Our pastures are not set up to accommodate her but we can’t let her live in a small pen for the rest of her life. And putting her down is not an option. Thank you for your time!!! Trying to put into writing how long I have had a love and compassion for animals is pretty difficult. I guess I can fill you in on how and why we started raising cattle and how we are in the situation we are in now. When our son was 7 years old, we decided we were going to join our local 4-H club. We had the land to raise animals and thought it would teach him responsibility. 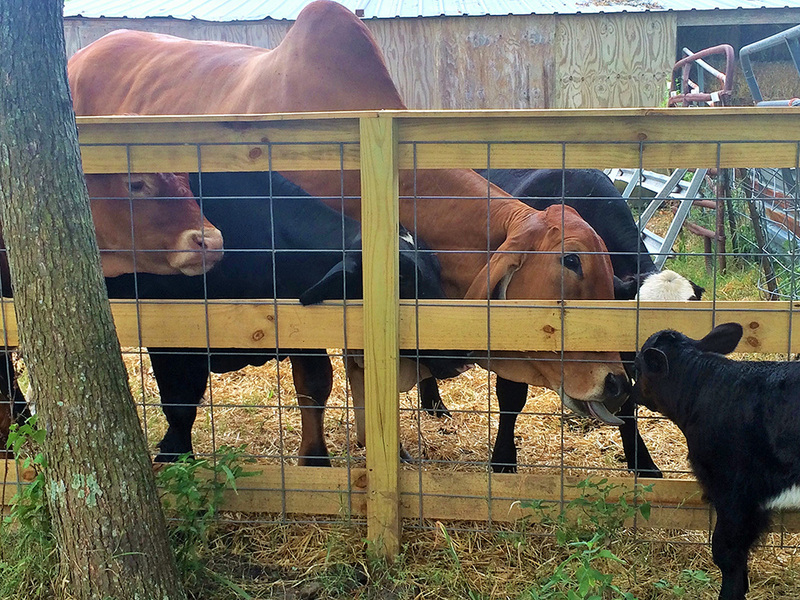 After showing goats for a few years, my husband thought it would be a good experience to raise and show cattle. 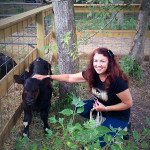 I have never been around cattle before, and all I knew about them were that they were huge! After raising a few heifers and being around them, I developed a love for them. We showed at a few “Major” shows and had to let go of our steer at the end. They were all terminal shows… Very hard!!!! I absolutely hated that part of all of this!!! Seeing the “truck” in the parking lot with all of the small holes stacked on top of each other was almost too much for me to look at. We got away from showing steers and focused more on showing heifers through the TCCA. Through this organization, you show your heifer and bring them back home with you. It’s a circuit where kids can win scholarships, letterman jackets, buckles and more. Your show animal was not sold in an auction or go to a sale barn. This was a way more desirable way to show our cattle. After my son was done with showing our heifers, we still had around 15 head. Some kids would buy our heifers/steers to raise and show through FFA, 4-H or TCCA. 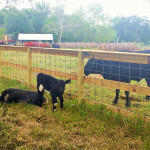 The majority of our cattle, we have kept and raised on our property. We have bred several of our heifers, and over the last few years it has really started to get to me the outcome of some of our steers. 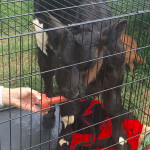 In the beginning, having new baby calves was always exciting and very sweet. Now, all of that has changed for me. Not that there is an overpopulation of cattle, but the entire process of the “sale barn” to being slaughtered. I am not a vegetarian, however, it is getting more difficult when a decision has to be made if we do have a steer. 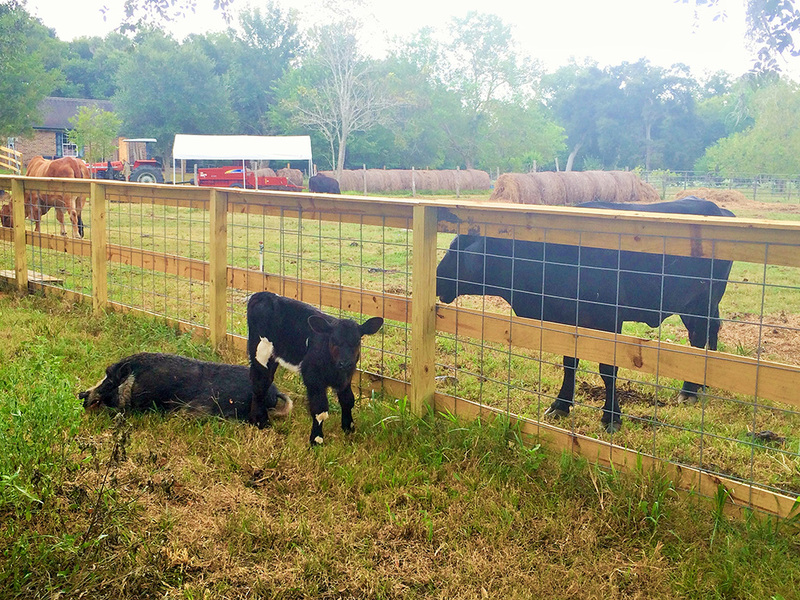 The majority of our cattle graze on our property and are pretty much our pets. There have been occasions when my husband has taken one to the sale. For the most part, they are still here and are very well taken care of. Big Momma is one of our Maine Anjou cattle that we have had for around 6 years. She recently had baby Stormy back in May and little did we know, Stormy was not nursing. After 2 or 3 days, we noticed Stormy was not walking or playing like most new babies. We were able to tie Big Momma up and got Stormy to the barn. She would not walk, stand or drink from a bottle. We took her straight to the vet and they kept her for about a week. They tube fed her, got antibiotics in her and got her back to health. She had become septic and the infection went to her eyes. The vet thought it would clear up with time, but she is still blind. We were able to move her mom outside of Victoria to a 300 acre ranch. No one lives there, and they only go up to check on the place every once in a while. She has very bad joints and it’s very hard on her to walk for a long distance. At the time, I just had to do what I could to get her off our property so she could not be bred again. I would love very much for her to be able to come to your ranch with her baby and have a chance of life again. She is a lazy momma and doesn’t require much. 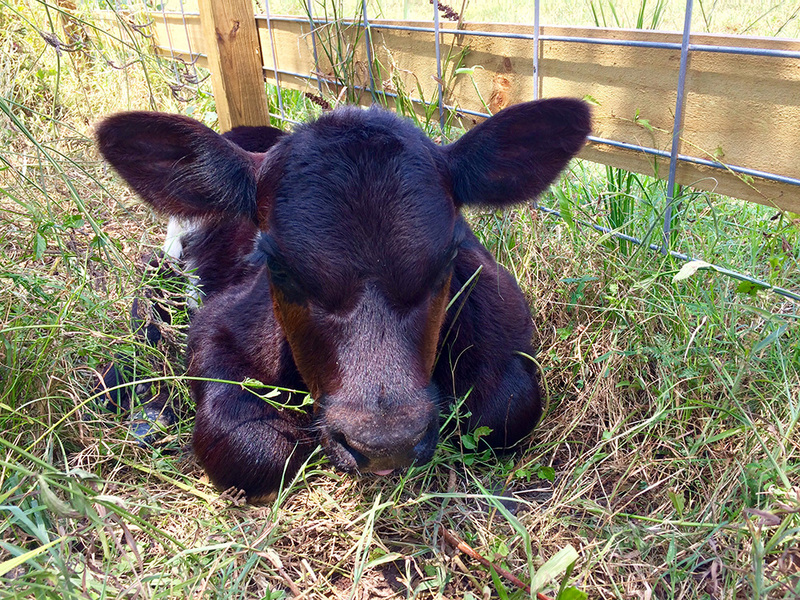 Our property is just not set up to accommodate a blind calf and I don’t want her to just live in a pen. Putting her down wasn’t an option and taking her to the sale barn would never happen. I would love for her to have a chance at life and to be a happy girl! My dream for Stormy is to feel safe in her surroundings, to feel loved and to gain confidence to go explore and just be a cow! And finally, here is Tammy’s last email to me regarding her experience with Rowdy Girl. My experience coming out to Rowdy Girl Sanctuary was very refreshing and comforting. 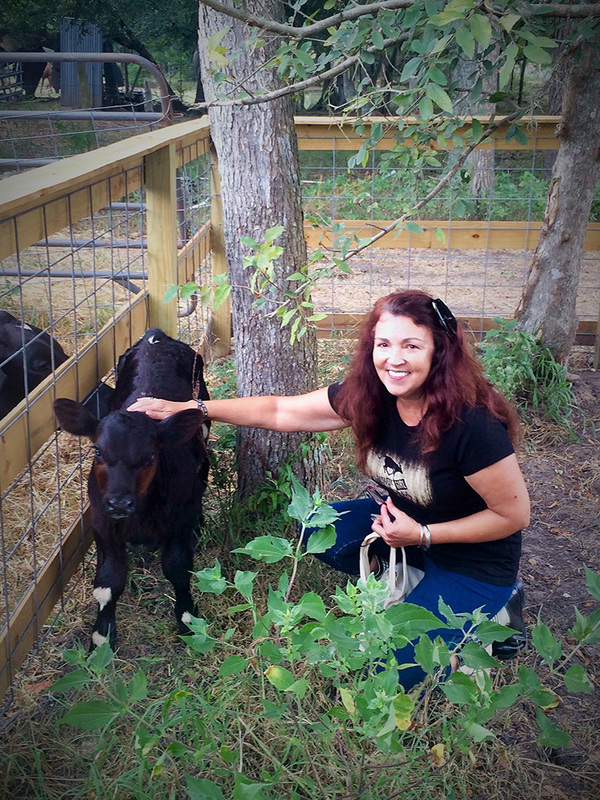 The day I found out that our sweet baby calf Stormy was permanently blind, I knew I had to find somewhere safe for her to live. 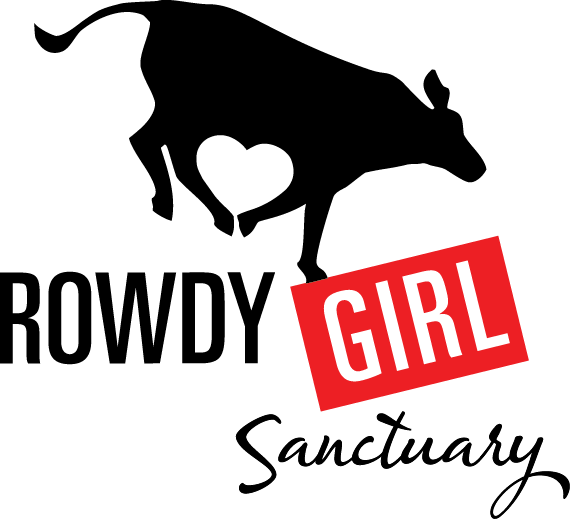 I researched on the internet and found Rowdy Girl Sanctuary. Renee called me immediately after sending a message to inquire her facilities for my baby girl. After a few weeks of getting Stormy strong enough to move to her new forever home, we made arrangements and made the big move! When we arrived at the sanctuary, I knew in my heart, Stormy was going to be loved and taken care of for the rest of her life! All of the animals that were at the ranch were so happy, healthy and coming up to greeting us. There was no fear in the animal’s eyes, they were calm, relaxed and seemed that they knew they were safe. I knew I had made the right decision for our baby and she would have everything and anything she will need in life. I am so very thankful for Rowdy Girl Sanctuary for taking Stormy and loving her the way she deserves. And a bonus, I connected with an amazing woman that has a love for animals the same as I do!!!! HISTORY of the breed: The Maine-Anjou Breed was founded in 1839 when the French Mancelle was crossed with the Durham – the purpose was to provide better Beef production. The French Mancelle provided hardiness, vigour and excellent milking-ability even under sparse feed conditions. The Durham provided quality carcase and rapid growth. In 1908 the success of the breed was assured so the Breeders formed a Society and named the cross Maine-Anjou. The name was derived from the two French Valleys where the new breed was flourishing. 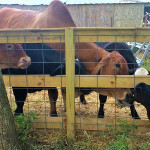 The Maine-Anjou excelled in their ability to grow and milk with only forage, and soon they were the most popular breed in that region. The combination of growth, milking ability and docility impressed practical cattlemen from Canada and the United States who saw the breed in France and this lead to the first Maine-Anjou importation into North America in 1969. I love your passion for animals Renee. You are an amazing woman. Your love and determination has proven to be a blessing to all the animals that have been lucky enough to end in a safe place where they will enjoy the rest of their lives free of the terror and the cruelty that surrounds farm animals.